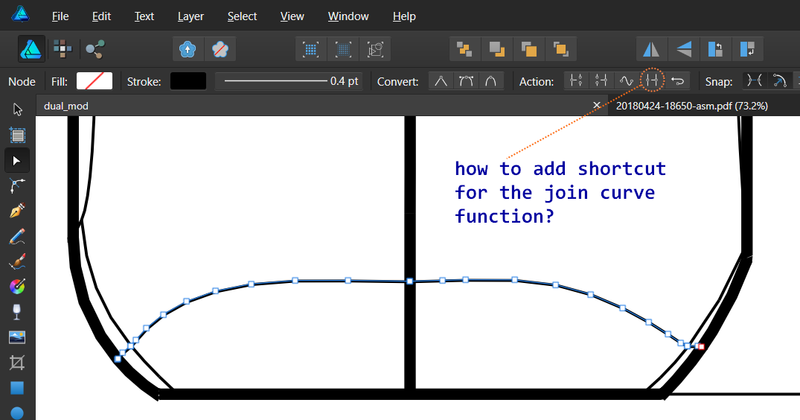 I am trying to add a shortcut for joining two curves in Designer as I use it frequently. But I am not able to find the the option for it. Could anyone help? Also is there any tool in Designer for selecting curves by attributes such as color, line weight etc? Go to Affinity Designer Preferences, Keyboard Shortcuts section set the first dropdown to Draw and the second to Pen Tool (or Node Tool both will do). Enter the shortcut you want for Join and Break Curves there. It works only if I select the Pen Tool and doesn't work if I select the Node-select Tool (but the UI button works). Is it possible to make the shortcut work in both Pen and Node Select Tool with the same shortcut as it's essentially the same function? Ok, I just assigned the same shortcut in Pen as well as the Node Select Tool and it's working fine. Is there any way to add a shortcut for "Close Curve" as well? It doesn't appear in the list of available keyboard shortcuts.